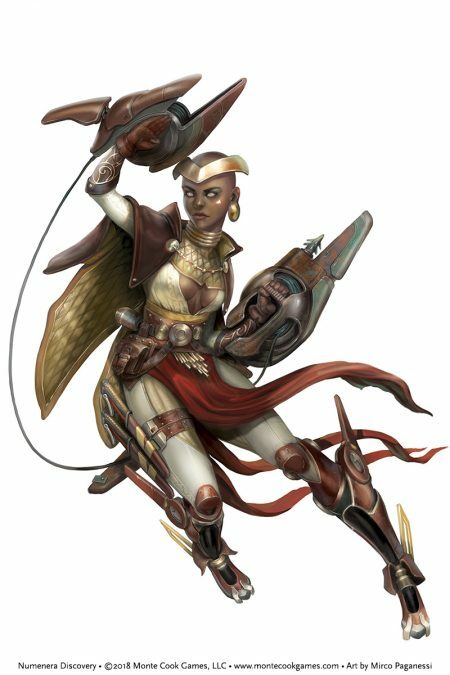 Numenera Discovery was an opportunity for the designers to take a hard look at Numenera player characters with a more experienced eye. We had observed the Numenera types in play for years, had designed new types for The Strange, Predation, Gods of the Fall, and the Cypher System Rulebook, and knew that we wanted to take all we’d learned and apply it to Numenera. In particular, we wanted to give players more choices for their characters. We knew the Nano was already a strong and versatile type, so much of our effort went into making sure that the Glaive and Jack had similar amounts of power and versatility. Glaives need to be the best at dealing damage with weapons. 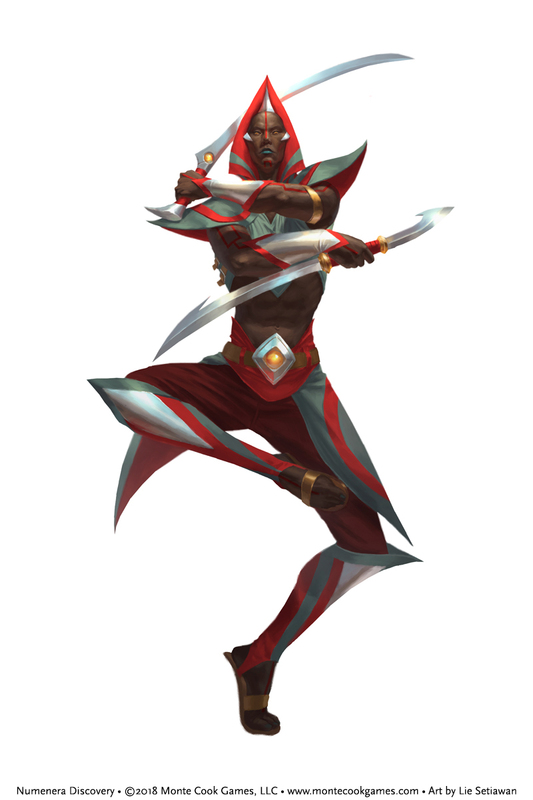 Thus, in the original corebook, most Glaive players chose Pierce or Thrust as one of their two fighting moves, since their Might Edge or Speed Edge allowed them to use that move for free. However, that meant in practice, a first-tier Glaive only had one additional choice for a fighting move. We ended up getting rid of both Pierce and Thrust, and giving all Glaives a first-tier ability called Combat Prowess, which lets them choose whether they add +1 to all melee attacks or all ranged attacks. Getting rid of those two moves meant we could create two new options for fighting moves at first tier. Because Numenera’s focus is on exploration and discovery (rather than just combat), we also wanted Glaives to have interesting options for exploration and interaction encounters. 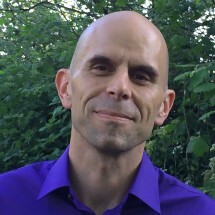 We created new first-tier fighting moves like Fleet of Foot, which lets you move a short distance as part of another action or a long distance as your entire action, and Impressive Display, which lets you perform a feat of strength that impresses nearby people and gives you an asset on interacting with them. As we tuned up the other Glaive tiers, we took a similar look at what was available, and made sure that every other tier had an option for exploration or interaction encounters. Glaives are still the best at combat, but that’s not all they can do. Originally, Jacks were a hybrid between Glaives and Nanos. Of the original tricks of the trade, most of them were actually fighting moves or esoteries from the Glaive and Nano types. We wanted Jacks to have their own unique flavor, so we built a whole new set of tricks from the ground up, with the idea that the Jack should be able to do a lot of interesting things and fill a lot of roles in a group of explorers. Now first-tier Jacks can choose tricks like Critter Companion, which gives you a loyal pet no larger than a cat, Face Morph, which lets you disguise yourself, and Vanish, which makes you invisible just long enough to get somewhere unseen or make an attack. Higher-tier Jacks have trick options for combat, exploration, and social encounters, and (if you want to make a Glaive-like or Nano-like Jack) can always choose a lower-tier fighting move or esotery instead of a trick of the trade. Foci also got a major upgrade: at third tier and sixth tier, each focus now has a choice of two abilities instead of just one. For example, at third tier, Bears a Halo of Fire lets you choose from Fiery Hand of Doom or from a new ability called Wings of Flame, which lets you fly and still take another action on your turn. At third tier, Wears a Sheen of Ice lets you choose from Freezing Touch or a new ability called Ice Creation that lets you create objects out of ice that are as strong as steel. 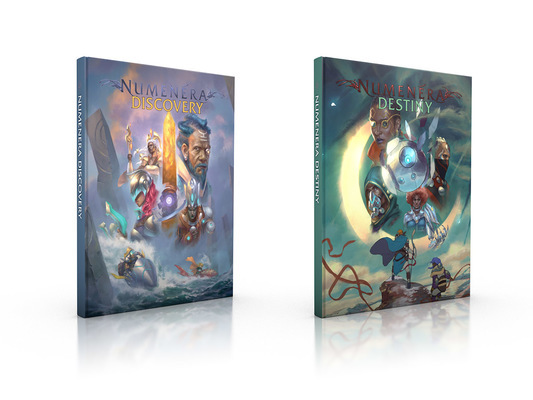 Catch more sneak peeks of Numenera Discovery and Numenera Destiny by subscribing to our website! We’ll be posting Numenera Design Diaries from the Monte, Bruce, and Sean weekly for the next few months. You won’t want to miss these first looks at new character options, rules for building and supporting communities, and much more!